SENIORS I THINK THEY CALL THAT A HATRICK!!!! 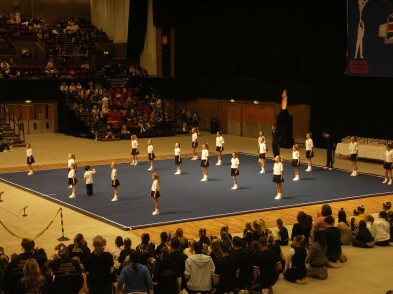 STC travelled from our home town of Littlehampton along the coast to the Brighton Centre, They had 2 coachs jammed packed with 100 people 75 of which were competing cheerleaders. They arrived to find loads of supporters, i think They had the biggest crowd there!! Which was nice and makes a change seen as when we travel up north our supporters can not always make it. It was a very busy day non stop for the coaches but every single STC Member took to the floor and loved every minute of it. They did Littlehampton, Sussex Tornados and British cheerleading proud. Our Peewees done a fantasic job after training for not long at all, they went out there and the judges loved them, nothing but positive comments on their scoresheets. STC are looking forward to working hard with them this year, as they are so eager to learn they will go Far!! Junior Champions is a brilliant title to come away with, and STC are looking forward to moving these up to Advanced, which they are more than capable of, They can not really compete in Intermediate anymore as champions, its a bit unfair, they need to give other intermediate squads a chance of champion status. Our group stunts all got great results, Especially Junior Coed who came away champions, Senior all girl did great coming 4th you rocked. Senior coed soooo close well deserved 2nd place. Junior All girls 8th place, you stuck every stunt that never happened in practice he he. Peewee Bless you all your so tiny and you went and showed them just what you had Well deserved 6th Place. Our scoresheets are going to help out a lot for 2007 there is always room for improvement even if you are the CHAMPIONS!!! We lost points in a couple of divisions, we were just lucky enough that it was enough not to lose a place. SO PROUD OF ALL THE TORNADOS THAT COMPETED TODAY - YOU WERE AWESOME AS ALWAYS - A HUGE WELL DONE TO OUR PEEWEES, WE ARE OVER THE MOON FOR THEIR FIRST COMPETITION THEY WERE FAB.